Charles McConnell, who has spearheaded DOE's efforts in the development of CCUS technologies for nearly two years, has announced he will resign as Assistant Secretary for Fossil Energy. Will Climate Change Hawk Kerry Kill Keystone XL? The Senate confirmed John Kerry as a Secretary of State by a vote of 94 to 3. I believe this is a turning point in the fight to stop the Keystone XL pipeline. Once again, I do not think that a man who had dedicated his Senate career to fighting catastrophic climate change would start his term as Secretary approving the expansion of one of the dirtiest sources of fossil fuels in the world. As America has stood on the sidelines, other countries such as Denmark, the United Kingdom, Germany, and even China have leapt ahead of us in developing offshore wind. Here a speed boat passes by Danish offshore windmills in the North Sea. SOURCE: AP. Since 1896, when Californians sunk the first oil well into the seabed from a wharf jutting 300 feet into the Pacific Ocean, the American offshore energy industry has been all about fossil fuels. But our potential is so much greater. "Drill now, drill everywhere" is a closed-minded strategy of the past. And with every day that goes by as we continue to focus on fossil fuels for energy, we fall further behind the rest of the world in the quest to diversify our offshore energy portfolio. By continuing to prioritize yesterday's technologies, we are locking ourselves into an energy future that dooms our climate, harms our environment, and sacrifices human health. The costs of coal, oil, and natural gas have all been kept artificially cheap by government subsidies and by our failure to make polluters pay for the negative effects of their emissions. Artificially lowering the price of these commodities slants the playing field, making it harder for new clean energy sources to compete in the marketplace. As America has stood on the sidelines, other countries such as Denmark, the United Kingdom, Germany, and even China have leapt ahead of us in developing one particularly strong-and commercially viable-renewable resource, which the United States also happens to have in abundance: offshore wind. As of June 2012 the rest of the world boasted 4,619 megawatts of total installed offshore wind energy capacity. Meanwhile, we have not even begun construction of our first offshore turbine. Lack of a clear regulatory structure, inconsistent messages from other ocean stakeholders, congressional budget battles, opposition to specific project siting, and instability in financial markets have all played a role in preventing domestic offshore wind from becoming a reality. In November 2012 the Department of the Interior announced the first-ever competitive sales on the outer continental shelf for offshore wind energy. This allows potential developers to bid on 277,550 acres in two wind energy areas-one off the coast of Virginia and another off the coasts of Massachusetts and Rhode Island. These areas are expected to be able to support more than 4,000 megawatts of wind generation-enough electricity to power an estimated 1.4 million homes. In October 2012 the Bureau of Ocean Energy Management signed its first lease under the "Smart from the Start" program with developer NRG Bluewater Wind, giving them rights to build a wind farm off the coast of Delaware. In May and August the bureau issued Determinations of No Competitive Interest for two cable routes to transmit power-one for the Atlantic Wind Connection off the mid-Atlantic seaboard and another for the Deepwater Wind Block Island project off Rhode Island. And in December 2012, the bureau began leasing and approving site assessment/characterization environmental assessments off the coast of Georgia and North Carolina. In December 2012 the Department of Energy announced that it will fund seven offshore wind technology demonstration projects, including Fishermen's Atlantic City Windfarm in New Jersey; technology projects in California, the Great Lakes, Connecticut, and Maine; and two turbines off the coast of Virginia. The recipients are eligible for up to $4 million each in project-development grants. The U.S. offshore wind industry is beginning to emerge from the political doldrums that clouded its early days, and it is finding champions in Congress, as well as in the Obama administration. Sen. Tom Carper (D-DE) led legislation to ensure that offshore wind is covered by key tax provisions that had previously only applied to onshore wind. Sen. Susan Collins (R-ME) championed funding for offshore wind development, including a deepwater pilot project in her home state of Maine. Governors such as Martin O'Malley (D-MD) and Deval Patrick (D-MA) have prioritized offshore wind development as well. They view it as a political victory on multiple fronts-creating sorely needed jobs in construction, operation, and maintenance, and contributing to a diverse energy portfolio while moving us closer to renewable energy targets and away from polluting fossil fuels. As political opposition falls away from offshore wind projects, opponents are turning more toward economic arguments against further development of this technology, suggesting it will increase electricity rates and ultimately cost jobs. As with any new product or technology, the first U.S. offshore wind farm will undoubtedly face steeper costs of construction and development than its successors. But as the industry grows, experience, technological developments, and economies of scale will cause those costs to decline. Multiple studies of the offshore wind industry in Europe have shown that the "learning rate"-the rate at which the overall cost of offshore wind energy development declines over time-can be as high as 10 percent per year. The question is not, therefore, whether the cost of offshore wind energy will come down, but rather how quickly. Cost-reduction rates will depend heavily on the amount of upfront investment the industry receives, including investment from the federal government. Thebillions of dollars in subsidies spent on mature industries such as oil and gas would go further in growing the nascent renewable energy technologies, which can in turn keep us competitive in the global market and create high-quality green jobs that reduce our dependence on foreign oil and help forge a new energy future. Finally, and perhaps most importantly, to truly level the playing field for offshore wind or any renewable energy technology, we must incorporate the cost externalities currently being ignored for oil, gas, and coal-fired power generation-most prominently the societal cost of pollution it generates, including the greenhouse gas emissions. Those who suggest Americans can't afford to spend more for energy in the middle of an economic recovery are ignoring the fact that we are already spending more for our energy than the amount we see on our monthly utility bills or at the gas pump. We're paying through Congress when we subsidize Big Oil. We're paying at grocery stores when food prices increase as a result of an epic Midwestern drought. And we're paying at hospitals as more of our children suffer from asthma and other maladies caused by unclean air. One of the catchphrases tossed around cavalierly in Washington by both parties is the need for an "all of the above" energy strategy. Conservatives say the president is failing to achieve this when he makes any decision not endorsed by the American Petroleum Institute. But the reality is no true "all of the above" strategy can be complete if it leaves out a commercially viable, renewable, and domestic resource that has the potential to make major contributions to our country's energy needs and our economy without perpetuating the negative and uncounted effects of our fossil-fuel dependence. While no single energy source can turn back the tide of climate change that is already raising sea levels, acidifying our oceans, and contributing to extreme weather events, as President Obama said in his second Inaugural Address, a failure to respond to climate change "would betray our children and future generations." Affordable domestic offshore wind can and must be a part of the response. - Michael Conathan is the Director of Ocean Policy at the Center for American Progress. Reprinted from the Center for American Progress website. As we've reported, the diminutive $25/$35 Linux computer dubbed Raspberry Pi is emerging as one of the biggest open source stories of this year. 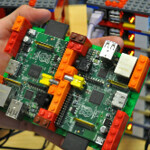 It's attracted all kinds of developers and tinkerers, is now running many different flavors of Linux, and there is even now a supercomputer consisting of many Pi devices lashed together with Lego pieces (see the photo). The education market has always represented a natural fit for Raspberry Pi devices, and this week news arrives that Google is giving 15,000 Pi devices to U.K. schools. That's just some of the Pi news arriving in the last few days. "Though some question the gift from Google, noting that the influence of big corporations should be kept out of the classroom, others note how important it is to get kids interested in computer science so that gains in the sector do not falter with the next generation." Actually, Google's Eric Schmidt began talking about pledging Pi devices to U.K. schools all the way back in May of last year, as we reported here. "Rebooting computer science education is not straightforward," Schmidt said at the time at an event in London, according to the BBC. "Scrapping the existing curriculum was a good first step - the equivalent of pulling the plug out of the wall. The question is now how to power up." The New York Times also ran an exhaustive retrospective on the rapid rise of the Raspberry Pi this week. "The Raspberry Pi Foundation began selling the computers in February of last year," the Times noted. "They soon could not keep them in stock." Who would have thought that a credit card-sized device running Linux and available for nearly no money would have such a profound impact? The Raspberry Pi story is actually only beginning. China's coal use grew 9 percent in 2011, rising to 3.8 billion tons. At this point, the country is burning nearly as much coal as the rest of the world combined. Coal, of course, is the world's premier fossil fuel, a low-cost source of electricity that kicks a lot of carbon-dioxide up into the atmosphere. And China's growing appetite is a big reason why global greenhouse-gas emissions have soared in recent years, even as the United States and Europe have managed to curtail their coal use and cut their carbon pollution. The first pilot plant in a program of installations that can sustainably produce crops, electricity, biofuels, and even plants for re-vegetation efforts in a desert environment is now up and running in the Middle Eastern nation of Qatar. The Sahara Forest Project, which brings outfits from both Qatar and Norway together, uses desert air, sunlight, and saltwater as inputs for a system that aims to be environmentally sustainable, beneficial for local human development, and financially viable over the long term. As the project's CEO, Joakim Hauge, puts it: "The Sahara Forest Project is all about taking what we have enough of, like saltwater, CO2, sunlight, and deserts, to produce what we need more of: sustainably produced food, water, and energy." The hope is that the pilot project can be scaled up to installations in drier and desert climates around the world. Standard solar power and concentrated solar power: Arrays of mirrors create concentrated solar power by aiming sunlight to superheat seawater into steam. That steam can then drive turbines to create electricity, and the heated seawater is then used throughout the greenhouse system. Additional sustainable electricity is generated from arrays of standard solar photovoltaic panels. Saltwater for fresh water and cool air for greenhouses: Hot desert air is pulled through a flow of seawater as it enters the greenhouses. This both cools and humidifies the air, creating optimal growing conditions for the agricultural crops within. At the far end of the greenhouse, the air is heated by flows of sun-heated seawater and then encounters pipes of cooled seawater, which causes the humidity to condense into fresh water that is then used for crop irrigation. Outdoor vegetation: Outside the greenhouses, the seawater passes through further evaporators to create humidity for vegetation sheltered outdoors. These include trees for desert reforestation, local vegetation, various forms of crops and livestock feed, and specific forms of plants naturally adapted to salt water which serve as feedstocks for bioenergy production and other uses. At the end, remaining seawater is collected into evaporation pools for the production of salt. Algae biofuel production: Lab-grown algae, which have been shown to generate up to 30 times more biofuel per acre than other plants, are grown in saltwater pools to create biofuels without taking up agricultural land or crops that double as food for humans. The basic advantage of the Sahara Forest Project is that it doesn't use any fundamentally new or experimental technology - it merely recombines established technologies in creative ways. At the same time, at least one of its goals - growing plants for reforestation - may be overly ambitious. "Trying to grow trees in the Sahara desert is not the most appropriate approach," Patrick Gonzalez, a forest ecologist at the University of California, Berkeley, told National Geographic back in 2010. "I can imagine that this scheme and type of technology in limited cases might work in certain areas like Dubai, where they're used to making palm-shaped islands and 160-story-tall buildings." But for the more modest goal of returning a desert to its natural former ecosystem, "it would be more effective, but less flashy, to work with local people on community-based natural-resource management." The fifteen thousand people who streamed into Bay-Area hospitals knew there was something terribly wrong with Chevron's Richmond refinery when it caught on fire on August 6th, 2012. What they did not now is that, according to a CalOSHA investigation released today, Chevron USA "intentionally and knowingly failed to comply with state safety standards" leading to a catastrophic fire that put workers and the surrounding community at serious risk. What happened on August 6th? A severely corroded pipe in one of the crude units (where they begin processing crude oil into gas and diesel) began leaking. Chevron chose not to shut down the leaking unit and instead ordered workers to remove insulation. The pipe then ruptured, igniting a massive fire. Luckily but narrowly, the workers escaped without serious injuries. Chevron did not follow the recommendations of its own experts and inspectors who first began warning back in 2002 that the piping that ruptured should have been replaced. When that pipe began leaking, Chevron failed to follow its own emergency shutdown procedures, putting workers at the site and thousands of area residents at extreme risk. The Chevron Richmond plant is the largest polluter in all of California, making the health and safety standards that much more important. In addition to all the pollution from this facility, there is a cloud of fear and anxiety hanging over the workers and the community of Richmond. When will the next accident happen? Will it be deadly? Is it safe for me and my family to live near the refinery? While Chevron claims that it intends to compensate community members with "valid claims" (what does that mean? ), monetary compensation will not address the ongoing health and safety concerns among workers and the community. As Chevron continues to use dirtier, higher sulfur and more corrosive grades of crude oil at the refinery, we can expect similar incidents and higher pollution levels. As an engineer, it's shocking to see the photos and reports from CalOSHA and other agencies, showing pieces of piping that were corroded by 80 percent with little more than a shell of the original pipe holding things together. This kind of shoddy and seriously negligent maintenance is not what you expect to see from one of the largest companies in the world (Chevron Corporation earned more than $200 billion in revenue last year). It poses a deadly safety risk to workers and residents alike. The Chevron Richmond refinery urgently needs a safety face-lift. Every recommendation from CalOSHA must be implemented immediately, and the use of dirtier, more corrosive and dangerous heavy crude oils must cease. Chevron needs to live up to its claims of caring about the environment and safeguarding its employees. The Richmond facility needs to be upgraded to meet modern safety and environmental standards to remove that cloud of pollution and fear hanging over workers and the community. Globally 131 million tons of ammonia were produced in 2010. The dominant ammonia production process is the Haber-Bosch process invented in 1904 which requires high temperature (~500¬∞C) and high pressure (150-300 bar), in addition to efficient catalysts. Natural gas or coal is used as the energy source of the ammonia industry. 1.87 tons of CO2 is released per ton of ammonia produced. Globally 245 million tons of CO2 were released by the ammonia industry in 2010 equivalent to about 50% of the UK CO2 emissions (495.8 million tons) in that year. In the Haber-Bosch process, the presence of ppm level oxygen may poison the commonly used Fe-based catalysts. In industry, extensive purification of N2 and H2 is needed and this remarkably increases the overall cost of the process. Therefore researchers have been seeking a simpler way for synthesis of ammonia from nitrogen separated from air. A maximum ammonia production rate of 1.14 √ó 10‚àí5 mol m‚àí2 s‚àí1 was achieved when a voltage of 1.6 V was applied. Potentially, this can provide an alternative route for the mass production of the basic chemical ammonia under mild conditions, they concluded. Up in the pristine Canadian boreal forests and freshwater deltas of Alberta, home to caribou, whooping crane and native communities settled long before Europeans arrived, a poisonous sore is being gouged out of the carbon-rich soil, a massive tar sands oil mining operation that could have huge climate impacts for people across the globe. New information shows that oil industry plans to more than triple production of tar sands oil in the coming decades will include additional dirty petroleum byproducts, making it even harder for Canada to meet its planned greenhouse gas emission targets. Right now there is one major project standing in the way of tar sands expansion-a roadblock that Canadian oil interests are desperate to crash through. That roadblock is the Obama Administration's decision whether to grant a permit for the Keystone XL pipeline, a $7 billion project that would pump more than 800,000 barrels of toxic tar sands crude each day from Alberta's forests through America's agricultural heartland to refineries in the Gulf, where much of the oil would be processed and exported. The administration is expected to release a supplemental Environmental impact Statement soon, with the final Keystone decision expected in coming months. You can help stop the tar sands devastation and protect the climate. Watch this video about climate threats posed by the Keystone XL tar sands pipeline and find out how to join the February 17 Forward on Climate Rally in Washington, DC. Climate scientists warn that further development of fossil fuel energy sources like tar sands oil will spell disaster for the planet's climate, a point made clear in the release of the draft study of the National Climate Assessment this month. "If we fully develop the tar sands resources we will certainly lose control of the climate, we will get to a point where we can no walk back from the cliff," says University of St. Thomas energy expert John Abraham, who has studied the climate impacts of tar sands oil emissions. "The refineries at the end of the Keystone XL pipeline are some of the biggest petcoke factories in the world today. By supplying them with tar sands bitumen, the petcoke embedded in the tar sands would find its way to the world market...petcoke from the tar sands is making coal fired generation dirtier and cheaper and this puts another nail in the coffin of any rational argument for further exploitation of the tar sands." The Keystone XL pipeline is critical for further expansion of the oil sands. Major financial institutions in Canada have said that the lack of pipeline capacity is a rate limiting step for the oil sands...if it's (Keystone XL) not build, it'll start to moderate the growth of the oil sands and it will send a clear signal to the financial community and the oil sands community that they need to address the carbon emissions that come from the oil sands. But growing opposition to the Canadian tar sands is not just a not-in-my-backyard concern--everyone is hurt by higher emissions from the dirtiest oil on the planet. The scientific community is especially concerned about rapidly melting Arctic ice, rising sea levels and extreme weather events associated with climate change that we are already witnessing. In December, some of the country's top climate scientists sent President Obama a letter urging his administration to reject the Keystone XL pipeline, citing last year's recent record-setting temperatures and storms as evidence that we need bold action to cut global fossil fuel emissions. Earlier in January, 70 groups wrote President Obama urging him to take bold and decisive action to help protect the nation against climate change's ravages. Danny Harvey, an energy and climate expert at the University of Toronto, said it best in our video: "Right now President Obama faces a critical choice. There's no better time to say no to further expansion, say no to business as usual, and to begin the process of turning things around." On February 17, join people from all walks of life, from climate scientists to ranchers and farmers, who will gather in Washington, DC, to call for strong action to fight climate change. The Forward on Climate Rally will point the way for Obama to shape his climate legacy. One of the most important decisions he can make is to reject the Keystone pipeline and to tell the EPA to set carbon standards for power plants. We the people have the power to demand action from our political leaders, to tell the lobbyists and oil industry fat cats that we're tired of their business-as-usual dirty energy campaigns. We want clean energy solutions that create new technologies and long-term job opportunities, including money-saving projects like NRDC's innovative plan to cut coal-fired power plant pollution.These are the kinds of investments that will build a more sustainable planet for all who inherit the Earth. That's certainly worth fighting for. Because if we don't, who will? For more information on how to sign up and participate in the February 17th march, check out the Forward on Climate Rally site. When historians look back on this moment in history, will they see a turning point? It is possible, as new studies seem to confirm what many people have already assumed; the developed world has hit peak car saturation. Since the massive economic meltdown of 2007-08, car sales have shrunk, and continue to shrink, not just in the U.S. but also in Europe. But don't celebrate yet. U.S. new car registration reached 14.5 million vehicles in 2012, which is a big comeback from post-recession years, but still a far cry from the more than 16 million vehicles sold in 2007. But more importantly, a new study shows that Americans are also driving less, and unlike auto sales, the number of culmative miles driven seems to be dropping. As this chart indicates, Americans drove three times more in 2007 than they did in 1975, racking up more than 3 trillion total miles driven. But after 2007, total miles driven has dropped by more than a 100 billion miles in the U.S., and seems like it may continue to go down. Americans are getting around by other means. In Europe, the story is much the same; new car registrations are estimated to be around 12.5 million vehicles, and could drop to as low as 11 million cars in 2013. This is the sixth-straight year in which new car sales slowed, as increasing fuel costs and ample public transit options convince Europeans to walk, bike, and take the tube as frequently as possible. But then there is China, India, and the rest of Southeast Asia. In China alone, there were 19.3 million new car sales despite what can only be described as the ninth level of Traffic Hell and air so thick with pollution that Beijing advises residents not to go outside. And yet car sales in China are still projected to go up another 10% in 2013. There are still plenty of aspirational human beings who need, and want, motorized transportation. Yet in the Europe and U.S. at least, cars seem to have reached peak popularity. What does this mean for automakers? A lot of things. Suffice to say, this may be a very important point on history...or perhaps just another blip on the graph. The post Is The First World Hitting Peak Car? appeared first on Gas 2. Keystone XL Pipeline - Will President Obama Violate His Own Inaugural Promises? Shell US Gas & Power LLC (Shell), a subsidiary of Royal Dutch Shell plc, and Southern Liquefaction Company, LLC, a Kinder Morgan company and unit of El Paso Pipeline Partners, L.P. (NYSE: EPB), intend to form a limited liability company to develop a natural gas liquefaction plant in two phases at Southern LNG Company, LLC's (Southern LNG) existing Elba Island LNG Terminal, near Savannah, Ga.
Subject to various corporate and regulatory approvals, Shell and Kinder Morgan affiliates have agreed to modify EPB's Elba Express Pipeline and Elba Island LNG Terminal to physically transport natural gas to the terminal and to load the liquefied natural gas (LNG) onto ships for export. Once finalized, EPB, through its affiliates, will own 51% of the entity and operate the facility. Shell, through its affiliates, will own the remaining 49% and subscribe to 100% of the liquefaction capacity. The project will use Shell's innovative small-scale liquefaction unit, which will be integrated with the existing Elba Island facility and enable rapid construction compared to traditional large-scale plants. Researchers at the University of Michigan have come up with a low-cost way to manufacture high-grade silicon, based on a concept familiar to anyone who has tried to make rock candy at home. If the breakthrough can be translated into a commercially viable process, it would make ultra-cheap solar tech like V3Solar's Spin Cell (which we were just raving about the other day) even cheaper. Ironically, funding for the research project came from the American Chemical Society Petroleum Research Fund, but maybe they know something we don't. As described by U of Mich writer Kate McAlpine, the new process works at just 180 degrees Fahrenheit, which is a far cry from the 2,000 degrees needed for conventional silicon manufacturing. The team has observed films of silicon crystals forming on the liquid gallium electrodes, but so far the individual crystals are only about 1/2000th (yes that's 1/2000th) of a millimeter in diameter. On a completely different note, the Obama Administration is also focusing on lowering the "soft costs" of solar power, which typically account for half the cost of a completed solar installation. Well, here's hoping. In any case, the really interesting part of the story is the involvement of the Petroleum Research Fund, which states at the top of its home page that its mission is to support "fundamental research directly related to petroleum or fossil fuels." In its vision statement following that declaration, the Fund waxes a little more expansive, describing itself as dedicated to "significantly increasing the world's energy options," though directly after the following note appears: "Proposals will no longer be considered in solar power, which includes photovoltaics and solar cells." Apparently the U Mich project got in under the wire, but it shouldn't be surprising that a grant-making organization with roots in the petroleum industry was at least once open to solar power research. Given the energy intensity of harvesting unconventional oil, most notably from Canada's tar sands, low-cost power in any form would be a welcome development for the petroleum industry. Will Nebraska become a real-life example of losing a battle to win the war? Environmentalists waging an ongoing fight against the Keystone XL pipeline were dealt a major setback this week when Nebraska Governor Dave Heineman signed off on the pipe's route through his state. Now all that stands between TransCanada, the company behind the pipeline, and broken ground is a signature from the State Department, the final decision about which is expected this spring. Between now and then, the sprawling unofficial coalition of green individuals and groups that have bonded in the last two years over opposition to the pipeline is gearing up for a final push. It's certain to be an uphill battle: Yesterday a letter signed by 53 senators put renewed pressure on Obama to say yes, and other than the rare rhetorical nod to climate action there are few clues that he'll approve the project. So the rhetoric of the next couple months could make or break the pipeline. Opposition to the Keystone XL has tended to coalesce around two different arguments, the tools in the anti-Keystone toolbelt: The first is that the pipe could deal a deadly blow to the global climate by raising the floodgates for oil from Canada's tar sands, believed by scientists to be one of Earth's dirtiest fuel sources; the second is that the pipe could pose a slew of localized threats on its path from Alberta to the Gulf of Mexico, from potential leaks contaminating groundwater to careless work crews plowing through fragile dinosaur fossil beds. Governor Heineman's decision seems to close the book on the state-level fight and steal some thunder from the localized argument, but leading Nebraska activist Jane Kleeb says local landowners aren't ready to cede their home turf quite yet. "Oh yeah, it's far from over. We have landowners asking us to train them in civil disobedience," Kleeb said. "These folks are not joking around. They homesteaded this land. They don't trust this company. And they don't want [the pipeline]. So they're going to do everything they can to keep it from crossing their lines." Kleeb says although she's made the global climate case to Nebraskans, in her experience the strongest battle strategy focuses on localized issues. She still has one ace in that hole: a lawsuit in Nebraska Supreme Court brought by a trio of landowners against Gov. Heineman, challenging the constitutionality of the state law that allows him to green-light the pipeline. So far the suit hasn't slowed the governor down, but Kleeb is hopeful that if the case falls in her favor it could throw a wrench in the works, regardless of the State Dept. 's decision. And she continues to trumpet the risk the pipeline poses to water and ecological resources in her state, arguing that the state's official map of the pipeline route misrepresents the size of the Sand Hills, a delicate Nebraska ecosystem that the pipe's original route cut straight through but that the approved route purports to make a point of avoiding (see map). But David Loope, a geologist at the University of Nebraska-Lincoln, says perceived threats to the Sand Hills and Nebraska's Ogallala Aquifer, which the pipe is still plotted to cut across, are overblown. "I'm conflicted," he says. "I think the pipeline is a terrible idea for global reasons. But the hew and cry coming from Nebraska is pure NIMBYism." Loope says the global climate change argument against the pipeline is far more honest, and he hopes to see that prevail as the leading opposition rallying cry in Washington, DC. There's a good chance it will: Bill McKibben, the environmentalist who's become the Keystone XL's most public opponent, said in an email that while he'd love to help save Nebraska, putting climate front and center is the best way to save the rest of the world, too: "The fight has always been about whether the president actually means what he says about about fighting climate change. We'll find out." Director Michael Brune on his historic decision for the enviro group. Earlier this week, the Sierra Club announced that it is lifting its long-standing institutional prohibition on civil disobedience so that it can protest the development of the tar sands. The club's board of directors approved the change, which executive director Michael Brune made public on Tuesday. While staff and board members have previously participated in acts of civil disobedience in a personal capacity, this is the first time that the organization will take part. The Fall 2012 edition of the Montana Policy Review focuses on community responses to energy development. Among other topics, it discusses the challenges being faced by Sidney, Montana. The garbage rate has more than doubled. The crime rate has almost doubled. In one day, the volunteer fire department responded to three fires before noon. $55 million is needed for infrastructure, including fixing a waste lagoon and water and sewer mains. In this all volunteer city, city council meetings have gone from twice a month to four or five per month. The mayor states that the volunteer citizens for the fire department, variance board, and more are "all stressed out." In the 2011-2012 school year, there were 101 new students on the first day of school, an additional 184 added during the school year between September and May, and 150 who left after only a short stay. Twenty percent of incoming students need special education services. Others need extra academic assistance due to learning gaps that prevent them from achieving grade level, due to prior multiple school moves. The school district has worker shortages because it cannot compete with the salaries in the oil industry, and many workers cannot even find affordable housing. Sidney is not receiving enough revenue from the oil industry to take care of all of its needs. The oil and gas industry does bring profits to some, but in its wake there are many who suffer, including small communities that cannot absorb the impacts. Honda Transmission Mfg. of America, Inc. announced an agreement with Juhl Wind, Inc. to develop, install, and operate two utility-scale wind turbines (each rated at about 2MW) to generate electricity for the plant's operations. The plant manufactures automatic transmissions, gears and four-wheel-drive systems, including the next-generation Earth Dreams transmission technology. The two wind turbines will supply up to approximately 10% of the plant's electricity. Based on their location and actual wind speeds, combined output from the two wind turbines is estimated at 10,000-megawatt hours (MWh) per year. Globally, Honda has established voluntary goals to reduce the environmental impact of its products and manufacturing operations by 2020. This includes a 30% reduction in CO2 emissions from Honda products, and significant CO2 reductions from the company's plants and other operations, compared with year 2000 levels. Two Honda automobile plants in Ohio have earned the US Environmental Protection Agency's (EPA's) ENERGY STAR certification for the sixth year, while a Honda auto plant in Indiana earned the designation for the first time in 2012, boosted by energy efficiency gains from the start of a second shift of auto production. See that cluster of lights by North Dakota? That's the result of fracking. Six years ago that light cluster did not exist. The reason is over the past years natural gas extraction though the use of fracking has increased exponentially as a result of the push for alternative fuel use and technological achievements. Fracking is the controversial method of extracting natural gas from shale rock using a chemical and water mixture. Depending on the methods used, some 29% of the gas being extracted can go to waste-or rather, into creating this light show. That light cluster is fire of natural gas burning as companies work all night to extract resources from the Bakken formation under North Dakota; a place whose citizens now call the "Kuwait on the prairie". The natural gas rush has been so sudden that North Dakota now has the lowest unemployment rate in the country - more than 41,000 workers got jobs there between 2008 and 2012. Additionally, seven years ago, the U.S. was importing 60% of its oil. Now oil imports are down to 42%. The Bakken fields play a major role in this. Natural gas is indeed making an impact, be it for better or for worse, and an impact that is now visible from space! The picture was taken by NASA's Earth Observatory, which orbits the planet twice a day some 512 miles up. The post The Impact Of Fracking On America's Economy... From Space appeared first on Gas 2.